Only son of Henry Courtenay, Marquis of Exeter and Earl of Devon, by his 2nd wife Gertrude Blount. With his father and mother he was imprisoned in the Tower in Nov 1538, at the age of twelve; was attained in 1539; was specially excepted from Edward VI's amnesty in 1547, and was not released till 3 Aug 1553, after an incarceration of nearly fifteen years. The greater part of his imprisonment was spent in solitary confinement, his father having been executed soon after his arrest, and his mother released. Queen Mary showed him much favor on her accession. She was at once attracted by the personal appearance of her young kinsman, then twenty-six years old. The portraits of him still extant show that he must have been of tall and slight figure, with a typical Courtenay face, and that he had a very plentiful supply of natural light brown hair. He was created Earl of Devon on 3 Sep 1553, and knight of the Bath on 29 Sep. At the coronation he carried the sword of state, 1 Oct 1553, and he was formally restored in blood on 10 Oct. He received the Spanish Ambassadors on their arrival in London on 2 Jan 1553/4, and acted as special commissioner for the trial of Sir Robert Dudley on 19 Jan 1554/5. But Courtenay was encouraged to seek higher dignities. Although Queen Mary affected to treat him as a child, ordering him to accept no invitations to dinner without her permission, she regarded him with real affection, and Stephen Gardiner, Bishop of Winchester led him to hope for her hand in marriage. Elated with this prospect he maintained a princely household, and induced many courtiers to kneel in his presence. Encouraged by Gardiner, he and his supporters seized every opportunity to blacken Felipe II's name, and distributed pamphlets claiming that he was hated in Spain for his 'excessive pride and small wisdom'. The projected match was popular with the people, but the offer of Felipe II proved superior in Mary's eyes. Mary was eleven years his senior, whilst her sister was then only twenty years of age; it can scarcely be wondered at that Courtenay, whilst paying, as in duty bound, the greatest deference to the Queen, secretly preferred Elizabeth. Princess Elizabeth was, on the other hand, not blind to Courtenay's attractions, and he was urged to propose marriage to Elizabeth as soon as Mary showed herself indifferent to him. So that, although Mary at once restored him to his estates and created him Earl of Devon, "to him and his heirs male for ever," on the third of Sep, 1553, he seems to have carried on a private flirtation with Elizabeth, and to have actually pledged his faith to her. The plan to marry him to Elizabeth had been openly suggested by William Paget, a member of the Privy Council; but Courtenay had rejected it, on the grounds that it would be beneath the dignity of one of his unblemished lineage, and there was no evidence that he had ever had any secret correspondence with her. The national hatred of the Spaniard, it was openly suggested, would soon serve to place Elizabeth and Courtenay on the throne in Mary and Felipe's place. At the end of 1553 a plot with this object was fully mutured, and Devonshire and Cornwall were fully prepared to give Courtenay active support. Wyatt joined in the conspiracy, and undertook to raise Kent. In Mar 1553/4 Wyatt's rebellion was suppressed and its ramifications known. Courtenay was easily snared, for it was possible for the Queen to accuse him of treasonable negligence in failing to help prevent Wyatt's hordes from entering London. This was rather unfair, since Courtenay had received no training in the martial arts, but it served to put him safely behind bars. On 12 Feb, half an hour after Lady Jane's head had fallen in the straw, Courtenay was brought through the privy gate beneath St. Thomas's Tower (now called Traitors' Gate) into the Tower of London, where he was given his old room in the Bell Tower. Soon afterwards he underwent five examinations by Sir Robert Southwell on behalf of the Council, and was also brought face to face with Wyatt, but all he would admit was that a servant of his had gone to France without his permission. After his arrest, his mother, the Marchioness of Exeter, was banished from court, and on 3 Mar, Courtenay himself was moved to St Thomas's Tower. In May Courtenay was removed to Fotheringay. Simon Renard, the Imperial Ambassador, only too conscious of his heavy responsibilities, had begun to have serious misgivings about the wisdom of allowing the Prince to hazard his precious person in a country so ungrateful for the honour bestowed on it - at least as long as Elizabeth and Courtenay were alive to provide figure-heads for future insurrections. In Renard's opinion a more than suspicious negligence was being shown over bringing these two 'great persons' to trial, and could only conclude that 'delays were being created in the hope that something may crop up to save them'. Renard saw the Queen on Easter Saturday and took advantage of the occasion to express some of his doubts on the subject of Felipe's future safety. He indicated, in the most tactful manner, that until 'every necessary step' had been taken he would not feel able to recommend the Prince's coming to her country. Mary replied, with tears in her eyes, that 'she would rather never have been born than that any harm should be done to his Highness'. She promised to see to it that Elizabeth's and Courtenay's trials were over before his arrival. It was continuing to prove unexpectedly difficult to collect enough evidence against either of the suspects even to begin proceedings. As far as Courtenay was concerned, the circumstances were certainly suspicious and there had certainly been a good deal of loose talk; but he had not apparently actually done anything. He had not gone down to Devonshire. He had not at any time taken up arms against the Queen. He had not attempted to escape. Renard suspected that Gardiner was deliberately shielding his young friend, but had there been any direct proof against Courtenay it is unlikely that the Chancellor's influence could have saved him. As for Elizabeth herself, nothing fresh had so far come to light. Wyatt was being kept alive in the hope that he might yet be induced to incriminate her further, but although he is said to have signed a statement to this effect no such document has ever come to light. 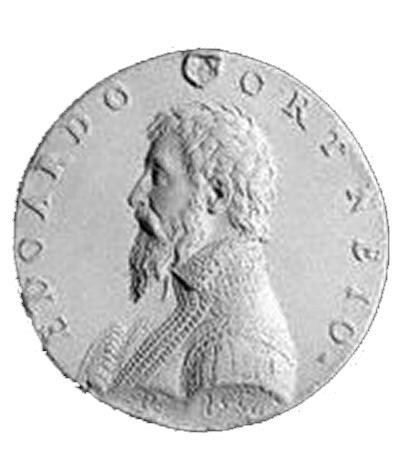 On 29 Apr 1555, at Felipe's instigation, 'the last sprig of the White Kose' was issued with a pardon, released from Fotheringhay and sent on a diplomatic mission to the Imperial court at Brussels, where he would be under the supervision of Carlos V. 'One of the embarrassments we have been apprehending is out of the way', observed Renard, but Courtenay had hopes of being summoned home before long, and left his house fully furnished against his return. He travelled to Brussels, whence he begged permission to return home in Nov 1555 to pay his respects to his mother and the Queen, but this request was refused. Mary never disgraced him, but she declined to see him again; and Elizabeth detested the very name of Courtenay ever afterwards. He then proceeded through France to Italy, and ultimately arrived at Padua, where he died suddenly, 18 Sep 1556. 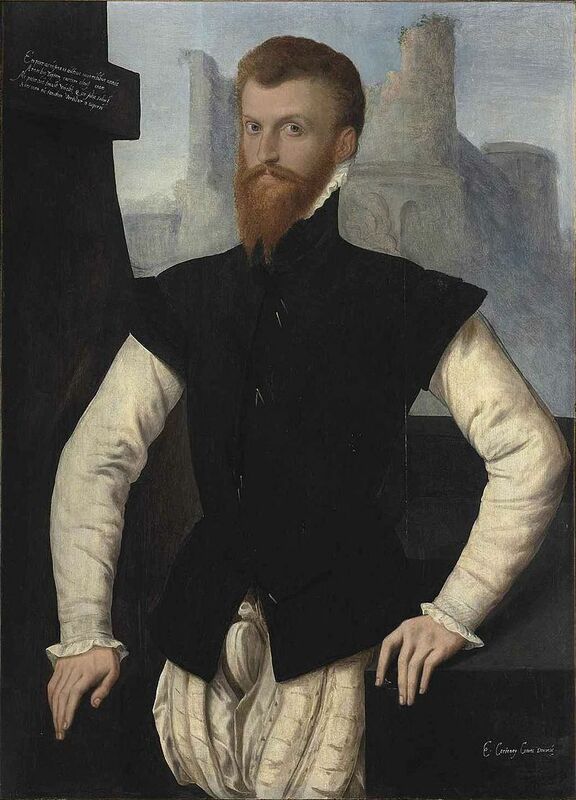 Peter Vannes, the English resident at Venice, sent Queen Mary an interesting account of his death: "for his Honest recreation... to see his hawks fly upon a wasted ground, without any houses" was caught "in a great tempest of wind and rain" Disdaining to leave, he further refuse to change his wet clothing upon returning home and, within several days he "entered into a continue hot ague, sometimes more vehement than at another... so that his tongue had so stopped his mouth, and his teeth so clove together" that he couldn't take the Sacrament at the end. It has been always believed that he was poisoned on suspicion of being a Lutheran. But most probably he had died of syphilis. Courtenay translated 'The Benefit of Christ's Death' in 1548, apparently with a view to conciliating Edward VI, and dedicated it to Anne Stanhope, Duchess of Somerset. The manuscript in now in the Cambridge University Library, to which it was presented in 1840, and contains two autographs of Edward VI. At his death, the estates at Tiverton, Okehampton, and elsewhere, were divided amongst representatives of the four daughters of Sir Hugh Courtenay, of Haccombe and Boconnoc, the nieces of Edward, the "Blind Earl". With Edward Courtenay the Earldom of Devon or Devonshire in the family of Courtenay became dormant, but the collateral branch of Powderham Castle, Exeter, claimed the title in 1831, and the claim was allowed by the House of Lords.